I leaning towards buying an Yoder Kingman. And wonder if there are any owners out there that can share some info about it. I'd buy a Yoder pellet cooker too. That's their bread and butter. I almost bought a fully loaded YS640 that came up on Craigslist before I got my Wichita, but decided to skip it because I wanted a new one. Not interested in an pelletcooker. have to learn to use it. 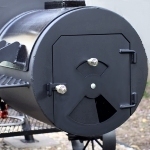 Just season it and build fires using charcoal and wood and become familiar with the smoker. If you do this I believe you will be pleased with it. I pulled the trigger and bought an Kingman. Was about to get Wicita, but didn't want to have all those problems most guys have with it. Will see how Kingman will work, guess I'll get it next couple of weeks. Got my Kingman today and played with it for several hours. Will post pictures and a longer update later on. After some cleaning and inside oiled up it was time to fire it up. To keep it short, Kingman works as it should I must say. Even if I haven't touched an offset before I had no problem maintaining 225-250F (left side) and 250-275F (right side). I could get it close as 0-25F between both sides. I noticed that keeping a small fire was the way to go, one wood split a time to keep even temperature. No coal bed, just added some logs and fired it up with my propane burner. No kiln dried wood, took some dry birch-wood some the pile from my father in law. No need to add charcoal, just one log now and then. Today it was no wind at all, and hot outside (27C). Nice smoke, everything from clear to thin blue smoke. I have the "updated" Kingman with air intake little bit lower than before. I still has lots to learn and it will be a pleasure to make some Q on this one. Intake damper was 1/3-1/2 open, no need to have it fully open! I'm glad that I took the Kingman instead of the Wichita. Sounds like an awesome smoker alright. If I ever make the jump from pellet pooper, I'll definitely have to give that one a serious look. How's the Kingman going? have you been happy with it so far? Really leaning towards it over the Wichita.